With a month to go a production had to finally mention the Christmas word in its’ title, and if any show could get away with doing so it would be this family musical like no other, that promises to bring together everyone’s favourite fairy tale characters. In a faraway land of snowy mountains, deep dark forests and gigantic castles, five nursery rhyme characters are getting ready for a Christmas with Mother Goose in their Book House. The trouble is, they’re all getting a bit bored of sitting in corners, looking after sheep, running from spiders, singing for their supper and putting the kettle on! They want a life of excitement and adventure, and if that means battling big bad wolves and a giant, so be it! The audience will join these unlikeliest of heroes on their mission to save a magical goose and make it back home to the book in time for Christmas. A perfect first theatre show to kick off the festive season for younger children recently introduced to the magic of nursery rhymes and fairy tales; Mother Goose’s Golden Christmas perfectly combines child friendly songs, rhymes, choreography, jokes, magic and a story to bring to life familiar characters to life before the young audience’s eyes. The company based on this production have a long career ahead of them in high quality children’s theatre; and the main cast of Mother Goose (Jenna Dobbs who is also the show’s talented producer, director and wardrobe department), Georgina Holliday as Miss Muffet, Daniel Fisher as Jack Horner, Eleana Barlow as Polly Finders, Peter Holliday as Tommy Ticker and Sian McMillan as Bo Peep) have the personality, enthusiasm, talent and professionalism needed for a long career in children’s entertainment both on stage and television. As an adult, stand out performances for me came from Anna Kozak as a Bubbles-from-Ab-Fab-like mime artist goose; Joel Sykes as the Big Bad Wolf and Steven Wainwright as the Bigger Badder Wolf who perfectly combined classic panto baddies and kids comedy double acts with a pinch of East End hard men; Felicity Thompson who deserved more stage time as the spider but from what stage time she did have seemed to be a marvellous blend of the Wicked Witch of the West and Mary Poppins; and of course Matthew Dobbs as Giant Bossy Boots, who not only managed to walk and see where he was going in his giant costume, but also managed to flamenco, box and bring the character to life with a tremendous Ray Winston, East Man Gang Leader accent. I also loved the classic stage chase sequence, tinsel skipping, underwater scene and egg puns (though not quite as much as Jack Horner did). I must also give a special mention to the very adorable and talented dancing children ensemble, who would not be out of place in any professional pantomime or stage musical and should be guaranteed places at any performing art schools they apply to. Two deserve especially to be highlighted, the girl who opened the show with a beautiful solo ballet routine that en-captured the joy of Christmas when you are a child, and the little girl at the very end who lead to the cutest Giant / lamb moment I promise you will ever see on or off stage. Backstage I must especially praise everyone involved with producing the Mother Goose’s Nursery Rhyme book, whose cleverly designed pages acted as the set for the show’s multiple pages and transformed children in the audience directly in the pages of their much loved stories. If you are looking for great kids theatre, that gives the annual Cbeebies panto a run for its money, then we highly recommend you look no further than the productions of Far Far Away Theatre. 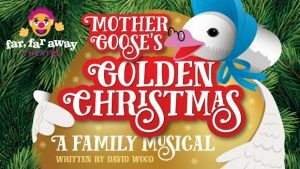 Your last chance to catch Mother Goose’s Golden Christmas at Montgomery Theatre, Sheffield is on Sunday 25 November at 1pm and 5pm. Tickets are £12. To book visit https://themontgomery.org.uk. Founded in 2017, Far Far Away Theatre is a new Sheffield based, professional, family theatre company that aims to bring theatre to everyone. For more information, including details of their next performance I Want My Mummy at the Montgomery Theatre from 29 to 31 October next year, visit www.farfarawaytheatre.co.uk.